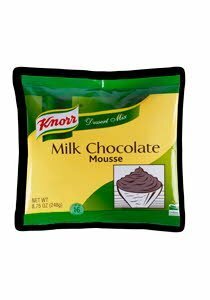 Light and creamy dessert mix used to create milk chocolate mousse and is a perfect filling for chocolate tarts. SUGAR, COCOA (PROCESSED WITH ALKALI), HYDROGENATED COCONUT OIL, GLUCOSE SYRUP SOLIDS (WHEAT, CORN AND/OR POTATO), GLYCERYLLACTO ESTERS OF FATTY ACIDS, SODIUM CASEINATE (MILK), TETRASODIUM PYROPHOSPHATE, CALCIUM LACTATE, XANTHAN GUM. For a quick and classic mousse dessert, just whip, chill and serve in a stemmed glass or create a wide variety of signature desserts. Garnish with whipped cream, fresh fruits and fanciful decorations. Pipe into chocolate cups, cream puffs or crepes. Fill pies and tortes and frost cakes. DIRECTIONS: 1. Into a mixing bowl, pour 16 oz (2 cups) of cold milk* (below 50ºF). Add contents of pouch. 2. Beat at medium speed for 2 minutes, scrape down sides of bowl, then beat at high speed for 3 to 5 minutes until fluffy and airy. Add desired flavoring and beat for 2 more minutes. Do not overbeat. For multiple pouch preparation, additional whipping time at high speed will be required to produce an airy mousse. 3. Pipe into serving dishes or use in various applications. Refrigerate. Best served when chilled 2 to 4 hours prior to service. Yield will be approximately 16 (4 fl oz) servings. Legout offers quick, easy desserts that boost check averages and deliver smooth, creamy textures that your patrons will love. Products come in a wide variety of flavors that are customizable for signature desserts. Perfect filling for chocolate tarts.